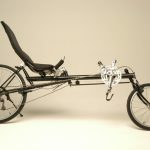 What sets Turner recumbent bikes apart from the others? The Turner frame design is primarily based on the strength of the triangle (as is outlined in yellow in the image to the right) providing solid, dependable support without the creaky flexing so common in other manufacturers’ designs. Because of this design, maximum strength can be provided with a frame that is light in weight, whether in the chromaloy models or the new, carbon graphite fiber frames. While always committed to providing high-perfomance, short wheelbase models, Turner has also been carefully researching ways to bring a practical, high-performance, long wheelbase design to the market. Long wheelbases have always provided the most comfortable ride, especially for long excursions. But they have been plagued with the problem of too large a turning radius. They often require two-lane turns in city streets, particularly in models with over-the-seat steering. By changing the frame geometry, Turner has now provided the market with the T-Long, which incorporates a frame that combines comfort with superior maneuverability. Now, one-lane turns are a reality for the long wheelbase. 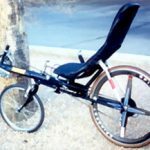 Unlike the flexible, non-durable, mesh designs on lesser-grade recumbents, our research has shown that the strong support of a solid seat foundation is critical for racers and other high-speed enthusiasts who need to ensure that maximum power is transmitted longitudinally from the lower back to the pedals. Constructed of a firm, composite material, combined with a breathable cover over waterproof padding, our seat is adjustable forward or backward and can be tilted at various angles. For riders in hot climates, the center of the padding, between the shoulder and lumbar region, can be cut out just leaving the mesh to provide additional air circulation at the center of your back and still provide padding support in the areas that need it. Unlike any other bike manufacturer, we also provide a special, separate lumbar cushion which fits between the seat cover and padding to provide critical lumbar support. For fine-tuning your comfort, this lumbar cushion can be slid up or down under the seat cover, but will still hold firmly in position. For added comfort, especially for those who like extended, cross-country adventures, we offer an optional, gel cushion that can also be placed between the seat cover and padding, but on the horizontal portion of the seat. And, as a bonus, the back of the seat has a handy pouch to store tools, spare inner-tubes, water bottles, or other necessities. 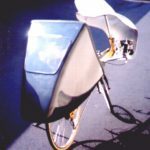 Holes at the end of the frame fork are provided to enable the attachment of a rack frame for toting extra items on long outings. The photo to the right is a detail shot of the newly redesigned seat support for the T-Lite and the T-Long bicycles. Note how the seat crossbar sits on just one tube rather than the three of the previous versions of this frame, and how the seat rests directly on two rubber pads (“elastomers”) to give the maximum in shock absorption and yet still provide firm support. 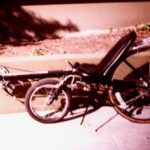 This simple and direct approach effectively supports the rider without the heavy suspension systems that too often flex the frame on other manufacturers’ models. Combined with other less obvious design changes over previous models, this has made the bike much cleaner and more open, and helps the bike shed a few ounces, which is always welcome. · USS offers the most ergonomically correct arm position with the arms at your sides. This results in far less fatigue, especially on long treks. And, the nice thing is that it is surprisingly easy to get used to. 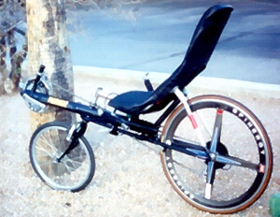 · Particularly on long wheelbases, a steering problem exists on many competitors’ OSS models, in which the long handlebar stem extending from the front of the bike force wide movement of the arms when making turns, resulting in the so-called, “tiller effect”. This awkward swinging of the handlebars from side to side results in a serious impediment to maneuverability. The T-Long offers OSS as an option, but has eliminated this effect by designing shorter stemmed handlebars intersecting the frame closer to the rider. 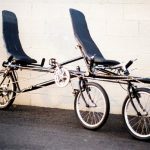 · The long handlebar stems of the OSS designs, for long-wheel bases especially, also result in an unacceptable addition of unnecessary weight, particularly to the die-hards in the sport. The shorter stem on our T-Long greatly helps to minimize this problem as well. Either way, OSS vs. USS is always a matter of personal preference, and we are pleased to be able to provide both steering systems that are optimized to provide you with the maximum in control and satisfaction.